Before I write anything else, I must first confess that I had never before read a Strugatsky novel. No Roadside Picnic, no Hard to be a God, nothing. 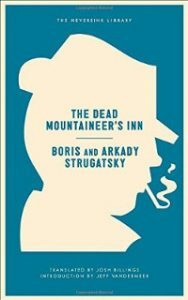 My efforts to read as much contemporary and newly-released sci-fi in translation as I possibly can, though, led me to The Dead Mountaineer’s Inn, translated into English for the first time since its original publication. I had no idea what to expect from these giants of Russian sci-fi, but now I know why they’ll be read as long as books exist. Imagine that you’re burned out from work and everyday stress, and you need to get away from it all. You decide to vacation alone at a mountain inn where you won’t know anyone and where you won’t have to think about all the annoyances that come with being a police inspector. You plan to ski, drink, drink, ski, drink, and read. And drink. But of course, that’s not at all how things turn out. You find yourself quickly caught up in a maelstrom of intrigue, deception, mystery, murder, ghosts/vampires/alien-robots, and an avalanche that cuts the inn off from the outside world. Wonderful. This, then, is the story of Inspector Peter Glebsky’s attempt at a vacation. When he first meets the other guests at the inn, he finds them strange, but not remarkably so. There’s Mr. and Mrs. Moses (the eccentric gazillionaires), Mr. Du Barnstoker (a magician) and his niece Brun, Simon Simone (physicist), Hinkus (a tubercular(?) youth councilor), Olaf Andvarafors (nicknamed “the Viking” because of his size and strength), Kaisa (the inn’s cook and maid), and Alek Snevar (the inn’s owner). At dinner that first night, the Moseses, Du Barnstoker, Simone, and Snevar tell Glebsky about the strange occurrences that have plagued the inn over the past few days. Objects have been stolen, wet footprints left in the hallway, strange faces staring into windows, etc. Without realizing it, Glebsky immediately jumps into inspector-mode, attempting to put these strange events together like a jigsaw puzzle that is missing half of its pieces. More strange incidents keep Glebsky on his toes, and when a sickly-looking, one-armed man arrives at the inn on the night of the avalanche, things start getting interesting. Olaf is found dead in his room; Simone thinks that Mrs. Moses is dead, though she later turns out to be very much alive; the new arrival (Luarvik L. Luarvik- yeah, it’s probably not his real name) demands a certain suitcase that was in Olaf’s possession and was confiscated by Glebsky; and Hinkus appears to have a double roaming the inn. After that revelation, Glebsky proceeds as if it never happened. He continues referring to himself as an inspector, threatening everyone with arrest and interrogation if they don’t cooperate with his investigation. I seriously don’t know what that admission was all about. Why would Glebsky pretend to be an inspector? Wasn’t he there for a vacation? Or did he come to the inn with some nefarious purpose in mind? And then, of course, there’s the usual avalanche of details and suspects and motives and incidents that come along with any good murder mystery, which always sends me into a spiral of “wait, what? who? I’m confused.” And yet, the resolution was not very satisfying because the authors never clarified why any one character’s motive was more or less plausible than the next. I was also wondering where the humor ran off to about halfway through. I really am a sucker for outrageous and unexpected endings, so maybe my expectations were just too high. Nonetheless, the Strugatsky brothers successfully crashed together the sci-fi and murder-mystery genres, with a little bit of the supernatural thrown in for good measure. And will I go out and read more Strugatsky novels and Russian sci-fi in general? You can bet your mountaineer I will!